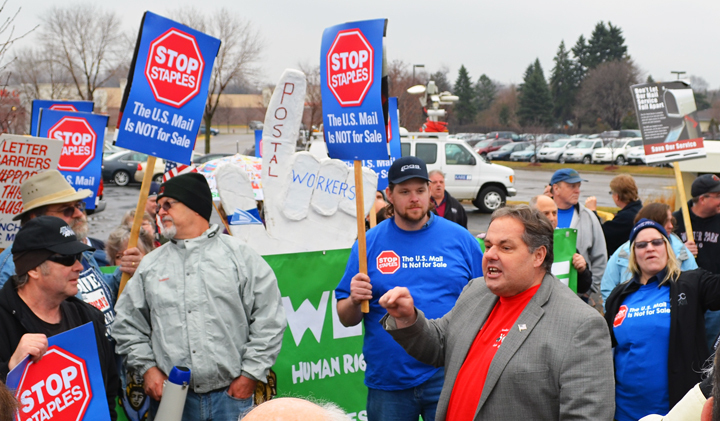 St. Paul Regional Labor Federation President Bobby Kasper spoke at the Stop Staples rally in Roseville on a nationwide day of action April 24. The boycott of Staples is official. The AFL-CIO last Friday approved the American Postal Workers Union’s request to add the office-supply retailer to the national federation’s list of endorsed boycotts. 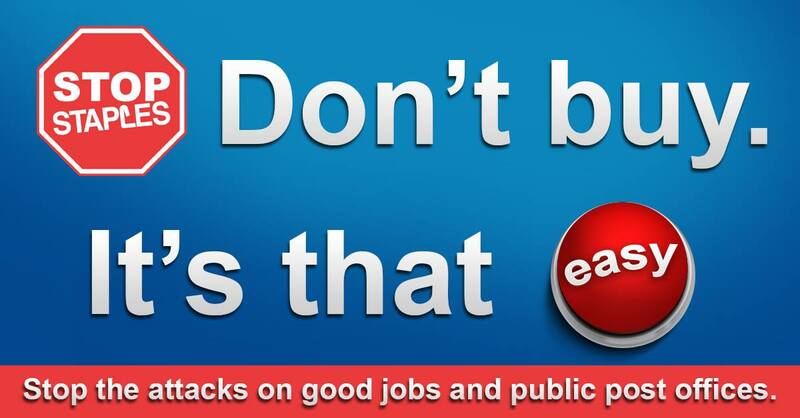 The APWU and other postal unions launched the “Stop Staples” campaign earlier this year, after the U.S. Postal Service announced plans to expand a pilot program placing service counters inside Staples stores. The counters are not staffed by sworn USPS employees, but by Staples employees who, when working full time, earn about $18,000 per year – and receive little training on how to handle the mail. 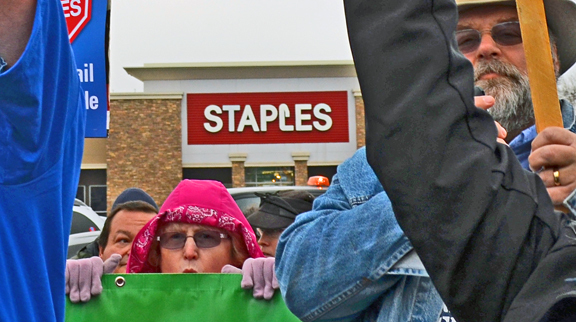 Postal Workers, Letter Carriers and other union members at a rally outside Staples in Roseville, part of a nationwide day of action April 24, decried the pilot program as a privatization scheme that threatens both middle-class jobs and the security of the mail. With the recently approved boycott, postal unions are taking the “Stop Staples” campaign to the next level. St. Paul Area APWU President Todd Elkerton said Staples is already feeling the heat. All four unions representing USPS workers – the APWU, the National Association of Letter Carriers, the National Postal Mail Handlers and the Rural Letter Carriers – have backed the “Stop Staples” campaign, and the AFL-CIO’s boycott will tap into the consumer power of 56 nationwide unions representing 12.5 million members. Teachers, in particular, will play a key role in the boycott, Elkerton hoped. According to some estimates, about one-third of Staples’ revenue comes from the sale of school supplies. The American Federation of Teachers, which represents 1.5 million teachers nationwide, is expected to consider a ‘Don’t Buy Staples’ resolution at its national convention in July.